Placer miners in northern British Columbia often feel caught up in David and Goliath-type battles when it comes to their dealings with government officials. Faced with stringent government regulations and restrictions, environmental and land claims issues plus rising costs of fees, fuel and transportation, some placer miners panning for gold in the Cariboo say they are losing ground. 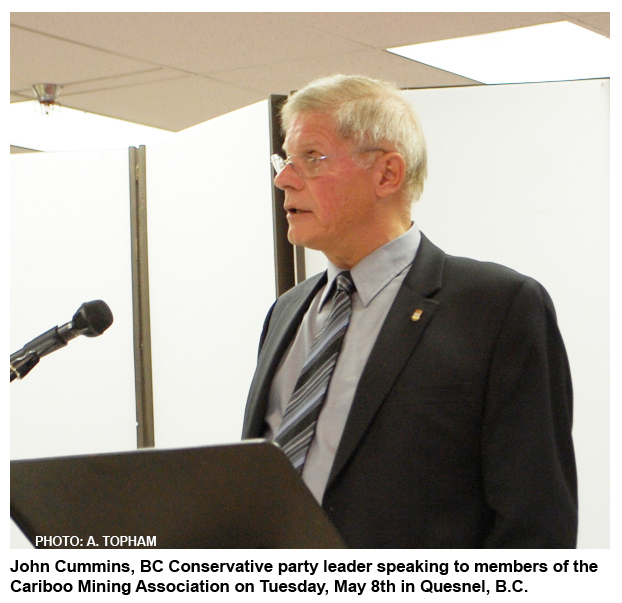 The situation could get worse, says Cariboo Mining Association (CMA) president Chris Winther. He believes proposed changes arising from a 2010 Ministry of Environment (now Ministry of Forest, Lands, and Natural Resource Operations or FLNRO) report will “kill” the placer mining industry in the Cariboo. 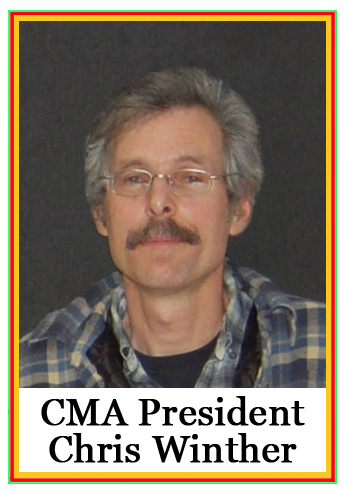 The report posted Wednesday on the CMA’s website, made its way into Winther’s hands a few days ago – he won’t say how. The document is an outline of an audit done of area placer mining operations conducted by ministry ecosystem staff during July and August of 2010. The report says the study was initiated in response to a “substantial increase” in the number of placer Notices of Work being received by government and concern about potential environmental impacts associated with this industry. The report says of the 23 “chosen at random” active placer tenures they inspected most of them (74 per cent) were found to be in non-compliance with their Notices of Work. There was no advance notice of the ministry inspections which is why Winther refers to it as a “clandestine” audit. “The results of the audit highlight the risk of aquatic, fish and riparian habitat impacts occurring in high value fisheries waters with inherent hydrological sensitivity,” the report notes. Key findings noted in the report include “inadequate reclamation (restoration) work,” unreported (environmental) disturbances and, in more than half the sites, work being done within the 10 metre placer riparian reserve setback. Recommendations in the report include “regionally stepping up compliance and enforcement on placer mine operations” and putting into place more environmental protections. Why did the ‘audit’ report take so long to surface? Why it was not made public until now is not clear. 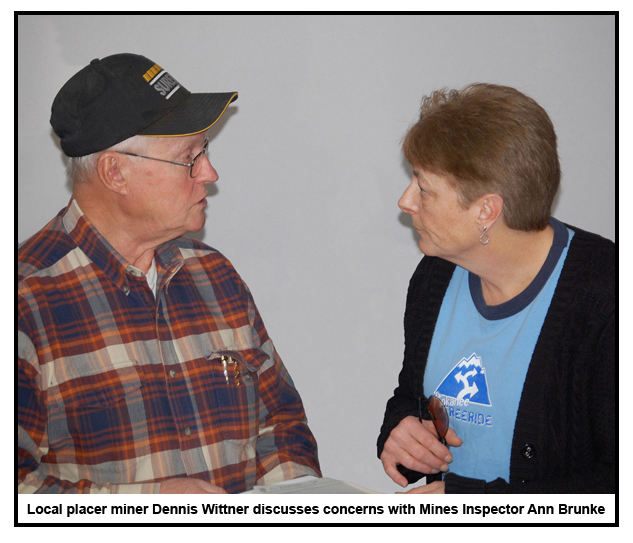 Winther agrees that some placer miners need to clean up their act and those who don’t are subject to severe penalties, he says. But his main focus is on how the report and its recommendations could impact miners who are doing their best to work within regulations and boundaries. Winther is even more concerned about other proposed changes. Winther adds the report needs clarification and correction. “We want to meet with the [environment] ministry people. We want to get the facts out and make things clear because this report is quite damaging.” He said he wrote government officials at the Williams Lake office requesting a meeting to talk about their plans and its impact on area miners. 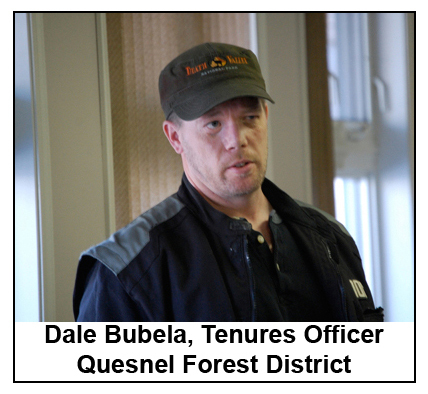 On Thursday, Winther said he had been advised by the “mines office” that ministry staff has agreed to meet with some CMA members on Jan. 22 in Quesnel. This – the audit report – is one of those challenges, he said. 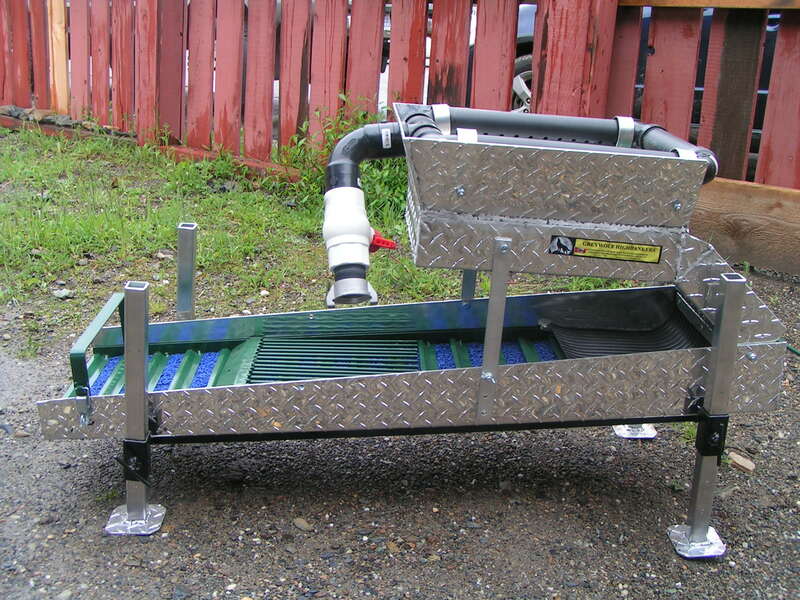 Just wanted to show all the CMA members some pictures of one of the prizes up for grabs at the Barkerville Gold Panning Championships. The unit is made by GREYWOLF HIGHBANKERS and it’s value is around $1500.00. If you want to see any of his products, check out the link below. 2012 Canadian National GOLD PANNING CHAMPIONSHIPS BARKERVILLE, B.C. 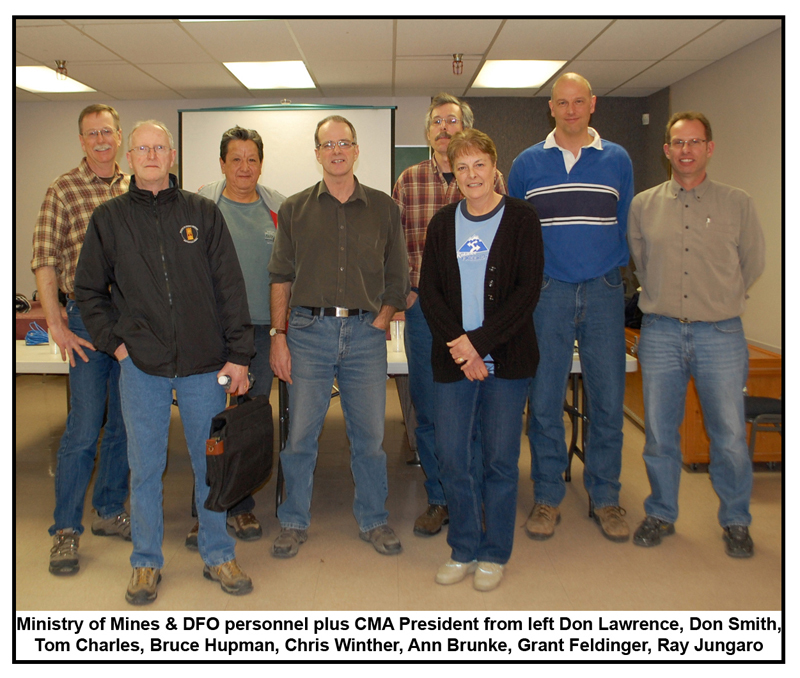 The new CMA executive for the 2012 – 2013 year (from Left-Front): Katie Wittner-D, Brenda Dunbar-Treasurer, Celine Duhamel-D, Chris Winther-President, Connie Hollenbeck-D. (from Left-Rear): David Erickson-D, Dennis Wittner-2nd VP, Don Rabby-1st VP, Jackie Sarginson-Secretary, Rick Wittner-D, Arthur Topham-WebAdmin, Don Kirkham-D, Edith Spence-D, Glenn Frank-D. 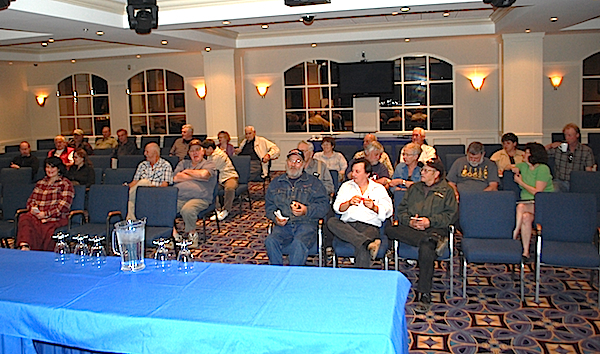 The Cariboo Mining Association met on Saturday afternoon, June 9th at the Billy Barker Casino in Quesnel, B.C. for its annual general meeting. 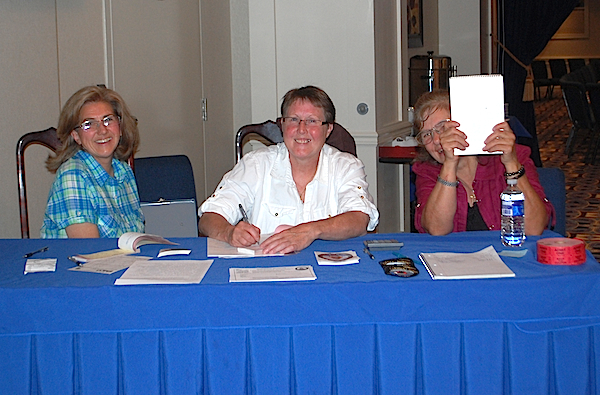 On hand to greet the miners and answer questions, renew memberships and sign in those attending were CMA members Brenda Dunbar (l), Connie Hollenbeck (c) and the elusive Edith Spence (r). 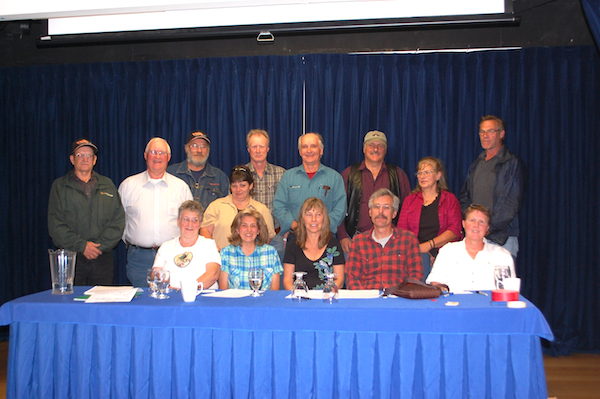 Members from around the Cariboo Mining District were in attendance. The Keynote Speaker for the AGM was C. Paul Jago, Regional Geologist – Omineca/Northwest from the Ministry of Forests, Lands and Natural Resource Operations working out of Prince George, B.C. Paul gave the audience an interesting talk on the geological history of the various regions of the province as well as entertaining questions from members specific to the Cariboo Proper. After the Keynote address and discussions ended a short break was taken followed by two draws for prizes one being a spill kit which President Chris Winther displayed for members and encouraged them to purchase from the local North Cariboo Co-op one of the many corporate sponsors which the CMA has gained over the last year. 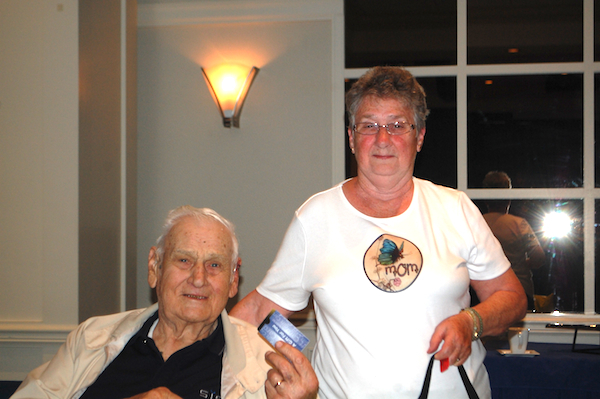 The second draw was for a dinner for two at the local Billy Barker Casino restaurant. 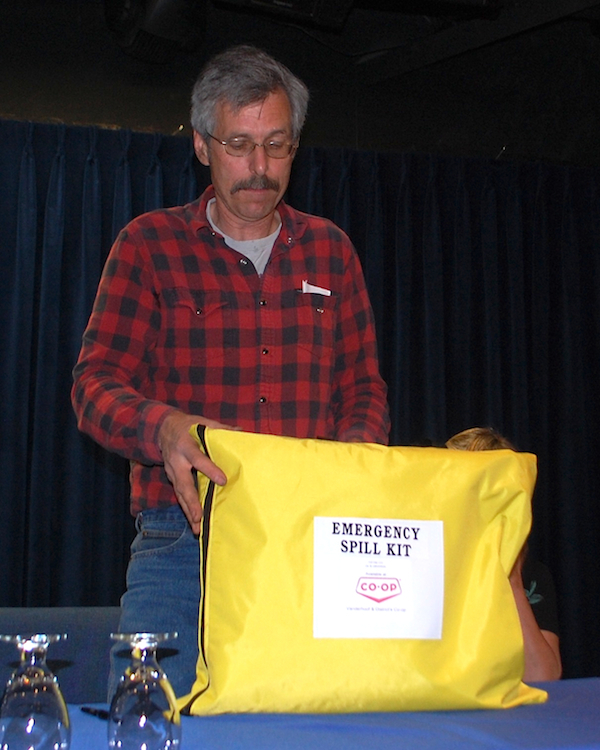 The winning ticket for the Spill Kit was the CMA’s “Lucky” Katie Wittner and the meal ticket was won by longtime placer miner Tex Enemark. Tex Enemark and Katie Wittner CMA members and lucky winners of the free draws. The final order of business was the election of officers for the upcoming year. Those now setting the direction for the CMA are listed at the top of the page. Congratulations to all of those who managed to lay down their shovels and pans and attend the meeting. Vancouver, BC – Taseko (TSX: TKO; NYSE Amex: TGB) (the “Company”) is pleased to announce that it has signed an agreement with the Tsay Keh Dene to support the exploration program and environmental studies for the development of its Aley Niobium Project in northeastern British Columbia. The Quesnel Seniors Centre was a lively spot to be on Tuesday evening as the Cariboo’s placer and hard rock miners gathered to listen to BC’s Conservative Leader John Cummins talk about some of the outstanding issues that are on the minds of most placer miners these days. John and his wife traveled up by car to the hub of the gold fields after CMA member Linda Brown had extended an invitation to him to come and speak to the association. While John has not had a lot to do with placer mining he did relate a story about how he had worked for a period of time on the WAC Bennett dam back in the 1960s when it was under construction and experienced what it was like working underground. He also told the audience that his own life as a commercial fisherman on the west coast of the province was in many ways very similar to that of the small, independent miner and the types of issues and concerns that the placer miners have paralleled his own experiences while working on his boat. The CMA has been pressing government on a number of issues regarding the volume of bureaucratic overburden that miners are expected to remove each year prior to going to work. Onerous permits and fees and increasing regulations in terms of first aid requirement plus complex forms to fill out were just some of the issues that came up for discussion. The topics of Environmental issues and First Nations consultations by each placer miner who is forced to comply with regulations that the miners feel ought to be dealt with by the provincial ministries were addressed by Cummins who also took time to explain to the members how the treaty negotiations have worked over the past twenty five years or so. As John put it if the resources of the province are not controlled by the province and dealt with in a fair and equitable manner to the benefit of all the citizens of B.C. then what’s the purpose in have a provincial legislature. John fielded a lot of questions from CMA members in the audience and while he didn’t have all the answers to the many issues he did assure them that his party would be taking their concerns seriously when they became either the Official Opposition or the party to run the province come the next election in 2013. After John had finished speaking he was given a warm round of applause and then was presented with a fine looking gold nugget donated on behalf of the CMA and member John Bot. Chris Winther, President of the CMA, made the presentation and thanked John for taking time to come all the way up to the Cariboo to speak to the group. As the heavy snows of yet another long Cariboo winter began their annual yielding to the warming rays of spring, Ministry of Mines officials from the Kamloops Regional District as well as Senior Habitat Biologist, Don Lawence from Williams Lake traveled up to Quesnel to meet with members of the Cariboo Mining Association to discuss issues of common concern. The day-long seminar at the Quesnel Seniors Center, while not as fully attended by local miners as last year’s workshop, did gain in numbers from other gold seekers further afield all of whom strained mind, ear and eye in order to take in what, for many, must have been at times an overwhelming plethora of government data pertaining to an industry that once required little more than a strong back, a pair of rubber boots, a $5 Free Miner’s License, compass, pick, shovel and gold pan. Commencing at 9 a.m. CMA President Chris Winther welcomed everyone to the event and in his opening comments stressed the fact that during these times of tough economic and political uncertainty it’s important to remember that there is strength in numbers and that the Cariboo Mining Association must stick together and expand its membership as it forges ahead. A great part of this effort to maintain solidarity while advancing Winther stated, included open and honest debate and cooperation with those government agencies assigned to work with both the placer and the hard rock mining industries throughout the province. Main spokesperson for the Mines branch, Bruce Hupman, Senior Inspector of Mines for the Mines & Minerals Division – South Central Region based out of Kamloops then took the floor and while introducing his staff and setting out the agenda for the day also echoed the words of Winther by further emphasizing the fact that Mines inspectors, in turn, were also dedicated to working with local and regional associations whose primary purposes were exploration and development of mineral extraction throughout the province as well as advocating for the miner. As Hupman put it the more communication between those working in the field with those assigned to safeguarding BC’s natural resources was beneficial to all parties involved. 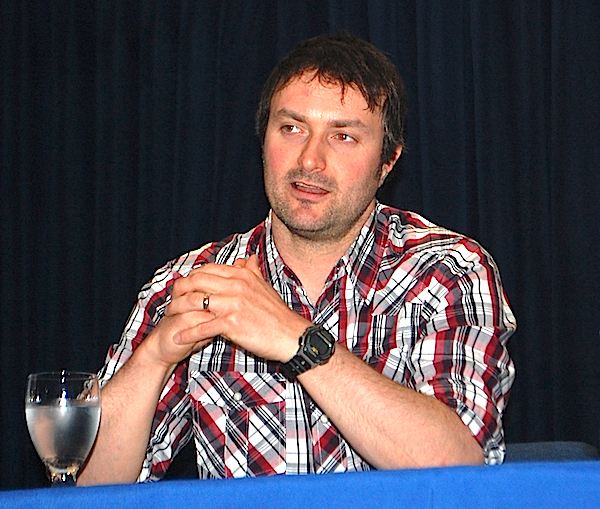 He then went on to explain that one of the main reasons for his ministry coming up to speak to the CMA again was to address concerns which the CMA had stated in a letter sent to Premier Christy Clark back in January of 2012; one also sent to the Minister of Mines as well as a number of other ministries and media outlets. Some of those concerns included fee increases, unreasonable limitations on yardage per claim, the downloading of government responsibilities on to the individual miner, road closures and habitat. The morning session (once an internet connection was eventually secured), commenced with a protracted lecture by Don Smith, Inspector for Mineral Titles & Mines, on the still controversial topic of Online Claim Staking. For those unfamiliar with recent developments in the mining industry this is a relatively new method of staking both placer and mineral claims that commenced back in January of 2005 when the BC government switched from the historic on-the-ground staking method to what many miners today feel is an extremely onerous, complex method of using computers to search out and secure a tenure of potential gold-bearing ground and then manage it. The term “onerous” is used on purpose due to the fact that the changeover started out with great government fanfare and expectations yet with little apparent forethought in terms of preparation in order to enlightening the mass of placer miners thus affected as to how to go about switching from a technology that formerly included chainsaw files, wooden posts, hand axe and compass to one of quantum changes encompassing internet browsers, pdf files, online mapping strategies, emailing and Global Positioning Systems; all of which were dependent upon relatively sophisticated technical skills, as remote from most miners’ experiences as the satellites that beamed down the data from space. As a former member of the teaching profession this writer will attest to the fact that Smith did his utmost to once again instruct his audience on the basics of navigating through the seemingly convoluted maze and impenetrable fog of computereze, megabits, boxes and windows and assorted links and chains that comprise the present Mineral Titles Online. For his efforts he deserves an “A”. As to whether or not a similar mark is deserving for having successfully inculcating the cyber-challenging process into the skulls of the placer miners present in the room that is something that remains to be seen. By all appearances the audience in attendance was, for the most part, still left awe-struck as to how the whole process worked, even after Smith’s earnest attempt to shed additional light on what must be, aside from the longstanding sore point of extreme restrictions on yardage, the most difficult aspect of placer mining today. For the average small miner, who cannot comprehend all the computer crafted conundrums involved in doing one’s Notice of Work, or Emergency Response Plan or Statement of Assessment in order to maintain one’s claims in good standing or even acquiring a claim online, the issue is not only mentally frustrating and stressful but also fraught with emotion and added monetary challenges for it inevitably necessitates having to hire a professional “agent,” at anywhere from $100.00 an hour or more, to do what once was reasonably possible using little more than normal common sense and some friendly pointers freely given from knowledgeable public servants who also once ‘historically’ manned government offices throughout the province. Smith’s introductory course on maneuvering about on Mineral Titles Online took the greater portion of the morning session and while it’s highly unlikely that the sediment of confusion had cleared by the time he was finished it should, in all fairness, be added that the actual MTO website, once reached, does provide much additional helpful information on making it somewhat user friendly when the basics are grasped. 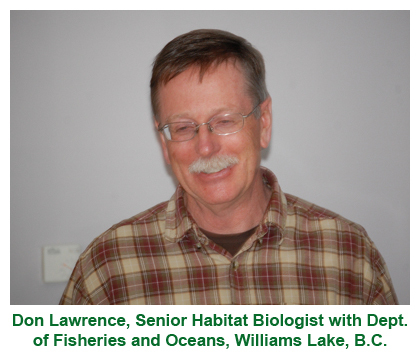 After lunch the miners were introduced to Don Lawrence, Senior Habitat Biologist with the federal Department of Fisheries and Oceans Canada working out of Williams Lake. Don proceeded to talk about his role within the bigger picture of placer mining and how it was his job to ensure that mineral extraction was carried out in a manner that didn’t necessitate destruction of fish habitat within BC’s rivers and creeks. He went on to talk extensively about the Water Act and all of the assorted regulations associated with it. 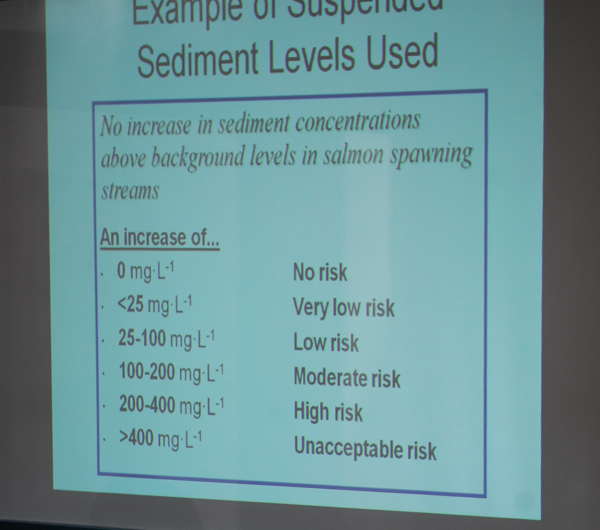 The question of sediments being added to fish streams was discussed at length and precipitated much in the way of discussion and queries from the audience as many miners felt that the little amount that they might possible introduce into the creeks and rivers is not enough to have any adverse, long term effects upon salmon or trout spawning. Lawrence went on to explain how various scenarios arise, some of which are natural processes and some due to mechanical occurrences, and how they affect fish at various stages of their growth and migration. 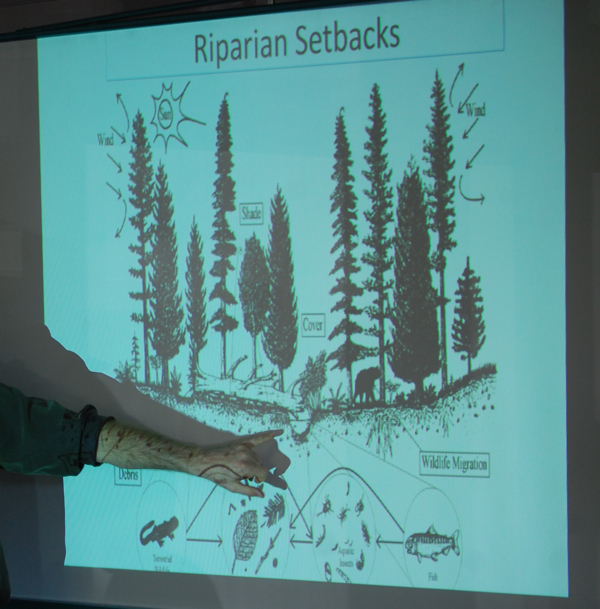 After covering the finer details of how fish are affected by different types of sediments the topic then shifted to what is commonly termed “Riparian Zones” or “Setbacks”. This is another area that has been a bone of contention for placer miners over the years as most miners realize that the closer one gets to the creek the more likely will the chance that gold-bearing gravels will be easier to find and extract. At this juncture in the discussion Bruce Hupman joined Don Smith and via the use of screen pictures began to talk about these Riparian Setbacks and how they work, not only with reference to placer mining but also in terms of how they are becoming an important factor in many other sectors where industrial and urban development continue to encroach upon an ever-diminishing landscape. From the graphs and charts it became quickly apparent that the placer miners were, relatively speaking, faring much better than other sectors of industry in terms of working distances from fish bearing streams. As it stands now miners can do mechanical work operations with 10 metres of the creek’s or river’s high water mark whereas in all other examples given there was a minimum of 15 metres of setback or even greater. After covering this aspect of the regulations the talks shifted to reclamation of disturbed ground and then permitting. It was at this point that Hupman held up in his hand a copy of the Health, Safety and Reclamation Code for Mines in British Columbia and like an Old Testament prophet announced to the audience, “This is the ministry’s bible whose word is law.” (or words to that effect). 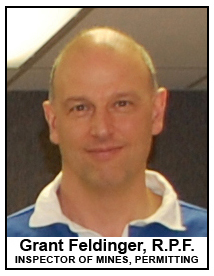 Grant Feldinger, R.P.F. Inspector of Mines, Permitting working out of Alexis Creek west of Williams Lake then presented information on this aspect of the industry with additional comments and suggestions from Ann Brunke, Inspector of Mines, Permitting from Kamloops. 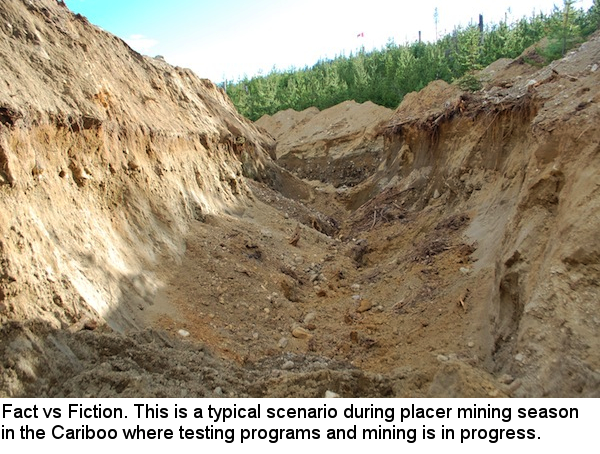 The reclaiming of ground that is disturbed during placer mining has been in the books for a long time and remains a primary concern for Mines Inspectors whose task it is to see that after testing and extraction has occurred that the environment is returned to as natural a state as formerly existed. Tied in to or concomitant with reclamation is the permitting process wherein inspectors determine beforehand the extent of any proposed disturbance and its potential effect upon the various environmental scenarios that might arise during actual mining. These aspects are included in what is commonly referred to as the Notice of Work (NoW) application and involve the production of maps showing areas where the placer miner will be either testing or extracting as well as data indicating the amount of cubic metres of ground proposed to be mined during the period of the permit along with the various types of mechanical equipment that will be used. 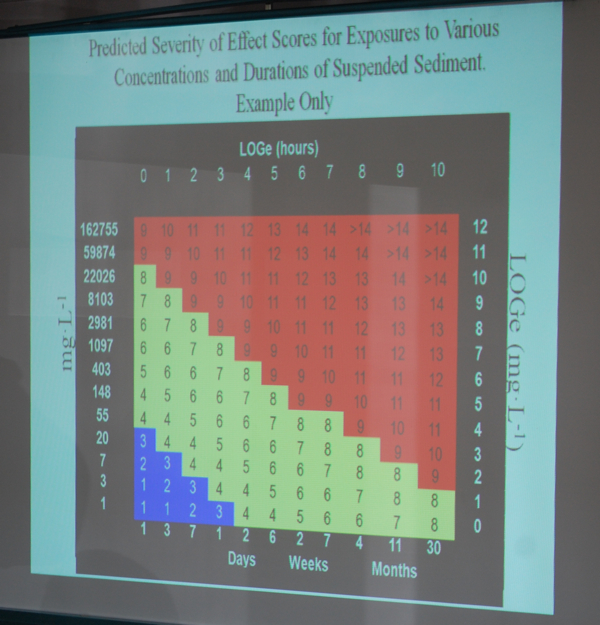 In the case of actual area of ground disturbance these factors come into play when the Mines Inspectors determine the size of the bond that is put in place prior to any actual work commencing. 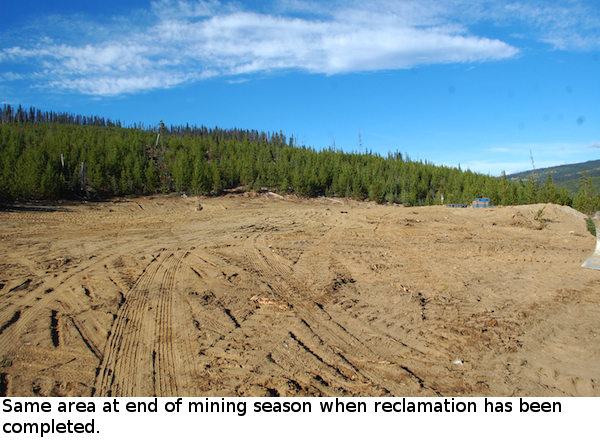 Bonding of course is the placer miner’s guarantee to government that once the proposed work has been completed that the ground disturbed will be reclaimed. The money is placed in security with the Minister of Finance and upon meeting the prescribed requirements will then be returned to the miner. In the event that the miner doesn’t live up to their end of the bargain said funds will then be used by the Mines branch to ensure that the reclamation is carried out. Another chapter of Hupman’s orange bible included the issue of safety for placer miners and was discussed at length. When filling out a NoW it is also necessary for the placer miner to provide the Ministry of Mines with what is known as a MERP or a Mine Emergency Response Plan. This plan ensures that any placer mining operation involving mainly mechanical means of extraction will have in place proper preparations in case of any accidents that might occur during the actual mining period and must include relevant maps and concise information on emergency contact information, safety equipment and all forms of communication that tie into ensuring that in the event of any mishap emergency response crews will be able to reach the exact location where the accident has occurred. While these protective measures are obviously self-evident when it comes to major mine operations where large numbers of personnel, equipment and infrastructure are involved they can be somewhat over-emphasized for operations that involve only one or two or three miners working on relatively small operations. A good example in terms of cost to the small operator was the issue of first aid equipment deemed by the ministry as essential in order to meet the requirements imposed by the Emergency Response Plan. 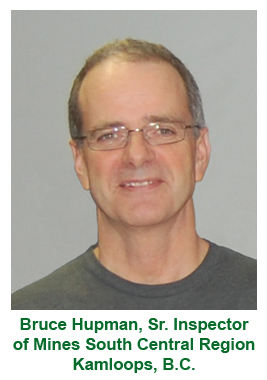 All mechanical operations on exploration sites are expected to have on hand a minimum BC-Level 2 First Aid Kit which costs around $150.00 (taxes included) or so it states in Hupman’s bible. But when the topic came up for discussion it was mentioned that now, on top of this, it was also necessary to have a Bag Valve Mask, 3 Blankets and an Oxygen Therapy Kit all of which suddenly brought the cost up to around $600.00 (taxes included). Then of course there are the spill kits to ensure that any liquids such as oil, grease or hydraulic fluids are cleaned up in the event of an accidental spill or mechanical breakdown all of which increase the costs to the small operator and assorted communication devices ranging from radio phones in vehicles to satellite phones and other high tech equipment. On a more positive note, in reference to the filing of a Notice of Work, it was brought to the attention of the local miners that some changes had taken place in terms of certain tasks involved in the permitting process; ones that the inspectors felt would help speed things up and ensure a quick turn around in terms of time spent on securing the required permit to go to work. 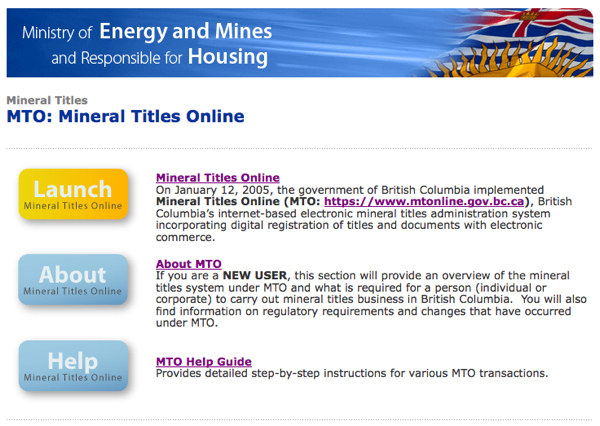 While it is still necessary to submit (electronically preferred) one’s NoW application to the Kamloops regional office as a first step (at which time the Inspector gives the application a cursory look in order to determine if all the main requirements have been met), if the basics are in order it is then sent back to Quesnel where it is goes to a newly-formed Front Counter office located in the Ministry of Forests buildings overseen by Dale Bubela, Tenures Officer with the Quesnel Forest District. 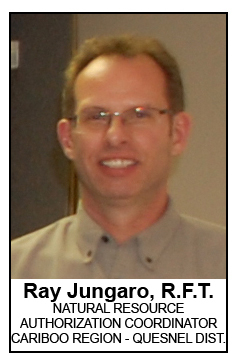 Working under Bubela’s supervision is Ray Jungaro, R.F.T. Natural Resources Authorization Coordinator for the Cariboo Region – Quesnel District, whose duties lie in further inspecting the additional requirements of the permitting as they pertain to issues dealing with third parties such as First Nations and Habitat. Once these aspects of the permit are cleared the application is returned to Kamloops for final completion. There still remains a 30-day period in which Jungaro does his due diligence to the process but in some cases the actual time period is much less. The seminar concluded with participants and Ministry staff continuing to chat about the different issues that had come up throughout the day. In order to summarize the seminar in terms of its objectives and its effects upon the participants I requested feedback from those in attendance who I had email contacts for. As well my own observations have played a major role in the determination of just how effective the overall process was so it should be born in mind that whatever criticisms are expressed here are not necessarily the general consensus of the CMA as a whole. 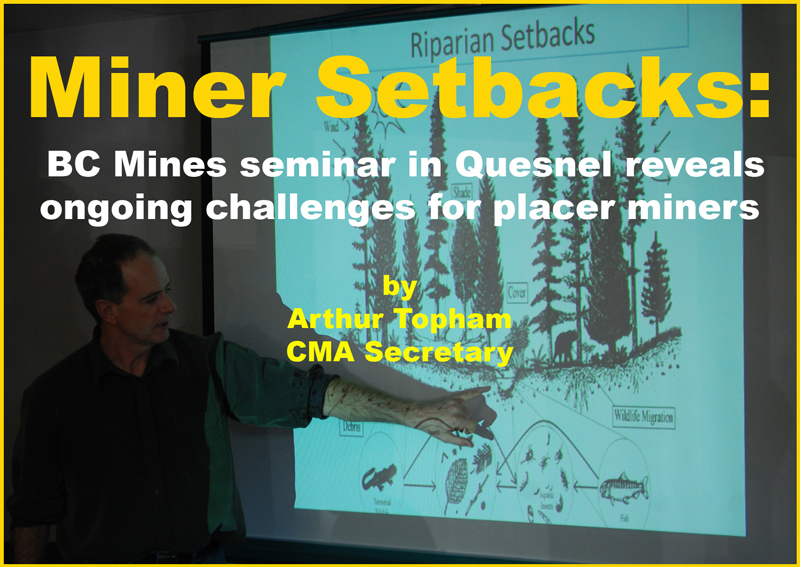 In revisiting Mines Inspector Bruce Hupman’s opening remarks at the start of the seminar regarding the reasons for coming up to speak to the CMA I returned to the original letter sent to the various ministries back in January to see how much additional light was added to the local concerns of the placer mining industry. Yes, some discussion had taken place regarding most, if not all, of the points brought forth in the letter especially in the areas of habitat and the downloading of government responsibilities on to the individual miners when dealing with third party interests and this was all good. In terms of any resolution to the perennial problems involved with simplifying MTO for the locals it was highly debatable whether or not Don Smith’s presentation did anything to reduce the amount of stress and confusion that’s involved in using the new computerized system for staking and maintaining placer claims. It is my opinion that something much more concrete needs to be done in the way of providing simpler, easy to use instructions in order for the average person to go about fulfilling their responsibilities in terms of applying for a NoW or doing their Statement of Work online or filling out an Emergency Response Plan and thus eliminating the need to hire costly outside agents to complete these tasks. It has been seven years now since the government introduced Mineral Titles Online and they still haven’t come up with a reasonable instruction manual, be it in CD format or actual hard copy, which anyone of average intelligence might use to do the computerized paperwork side of their business. 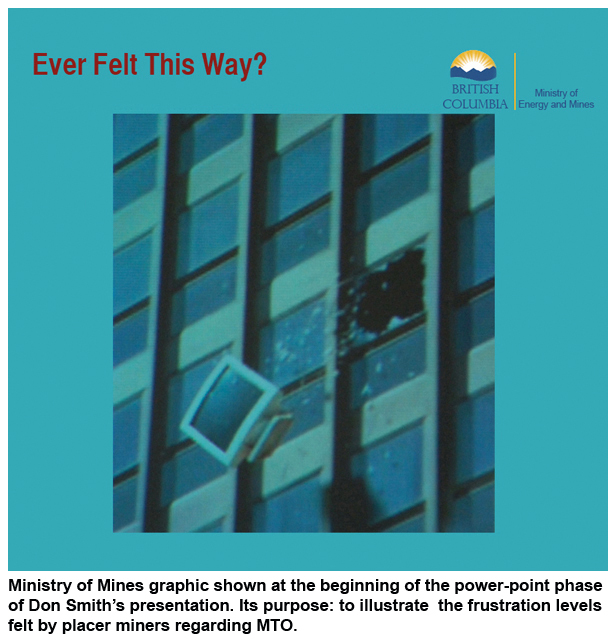 The fact that this hasn’t happened in such a long period of time is indicative of a lack of understanding somewhere within the government ministries with respect to their own responsibilities toward the people on the ground who are doing their utmost to make placer mining a viable industry and one that will continue to contribute to BC economy in a substantial way. Be it hiring a professional company that specializes in creating instructional programs or whatever, there needs to be a much greater emphasis placed on this one aspect of the industry that continues to remain a constant problem for miners since its inception. The one other major concern for the placer mining industry that received very little attention or address was that of the exasperating and debilitating restrictions on the volume of gravel that an individual miner is forced to comply with during what normally is a 6-month season of mining. It’s inconceivable that the Ministry of Mines is unable to get a grip on the fact that limiting a placer miner to a mere 1000 cubic metres of pay dirt per claim is the height of absurdity. Even assuming that the miner might recover an ounce of gold for every 100 cubic metres their seasonal production would, at best, amount to approximately 10 oz. That amount translated into current gold prices would mean a grand total of approximately $16,500.00 per season. Once all the costs of mining have been removed chances are the miner might net themselves a profit of between $5000.00 to $10,000.00. Hardly a politician’s or a bureaucrats or any normal working person’s wages by any stretch of the imagination and definitely not enough to even meet the equivalent of living on social welfare. Then, only to compound and exacerbate this problem, is the incredible lack of attention given to the granting of leases; one which, like the yardage question, has also reached the point of absurdity and is bordering on fraud for those many applicants who put down their money years ago are still awaiting word on whether on not their leases are to be granted. Now it may be true that decisions, such as the amount of yardage capable of being worked, ultimately rest with those within government who might best be described as politicians rather than bureaucrats but filling the gap that exists between the placer miner and the politician is a network of bureaucracy that ought to be fully aware of this extremely critical problem and, in turn, working in conjunction with the miner to resolve it by lobbying those higher up in decision-making portfolios to make the necessary adjustments in a timely manner so as to free up the miners who then can expect to work enough ground in a season to survive and continue building up their businesses. And yes, we hear talk of such changes occurring; rumours of major increases in the amount of pay dirt that sometime soon might materialize during the current sitting of the legislature yet nothing that anyone, be they miner or mine inspector, can actually put their finger on and say this is going to happen and when it will happen, all of which leaves the placer miner with a sense of lingering doubt and an inability to plan ahead for the future season. These are hardly positive initiatives for either government or industry and beg the question as to why the Minister of Mines cannot grasp the problem and quickly resolve it and let the industry know about it prior to the commencement of the upcoming mining season. In my mind these two primary concerns were still left unresolved when the seminar ended and will continue to plague the placer miner until they are dealt with in a timely and reasonable manner. We, the Cariboo Mining Association (CMA), are sending you this letter, partly by dog sled, in the hope that you will take serious note of our concerns as placer miners. The CMA is centered around the city of Quesnel and has been actively advocating for and representing the placer and hard rock miners of the Cariboo – Barkerville goldfields since 1952, adding to and providing both a steady source of income for both local miners and businesses as well as furnishing the province with resource revenues that have not ceased to end since the historic 1860’s Gold Rush. For the past sixty years or longer the region has been heavily dependent upon its forests as the prime source of revenue but as that industry is moving more and more into decline the search for placer minerals is once again on the upswing and along with the dramatic rise in the price of gold more and more people are once again staking ground and heading back to the hills in search of the yellow metal. 1. The constant threat of fee increases that target the established miners even though we have shown the unfairness of this practise. 2. The stymying effect of maintaining unreasonable and illogical limitations on the amount of yardage that can be mined on a cell in a season. 3. Being forced to pay a carbon tax on diesel fuel that we burn long distances from any urban centers. 4. Demands that we, as individual, small scale miners, negotiate with a separate level of government, i.e. First Nations, when it comes to obtaining the necessary permits to perform our work. And this in view of the fact that the provincial government itself has been unable to resolve longstanding treaty issues for close to a century and is now attempting to download its own responsibilities on to individual members of the private sector. 5. Government has closed long established placer areas and when asked why cannot scientifically or rationally justify their reasons for having done so. 6. Miners have been targeted as a cause of Caribou habitat destruction even though reclamation rules are in place to insure there are no ecological problems connected to our industry and meanwhile the government’s own forestry sector continues to carry out vast spraying programs of herbicides and pesticides that have long term, detrimental effects on the natural habitat of the region. 7. Government plans to deactivate access roads in mineral rich areas of the province when we view road accessibility as an asset to the prospector and ultimately, to the miner, the tourist and outdoor sports and recreation and fishing industries as well. These seven concerns are some of the main grievances which the Cariboo Mining Association has concluded are preventing their industry from expanding and moving forward in the years ahead. It is our firm belief that mining opened British Columbia up historically and the continuation of exploration and utilization of the provinces natural mineral resources ought to be pursued by government in a reasonable and responsible manner to ensure that the working people of this province survive in these challenging economic times. P.S. The envelope and information card contained in this letter are considered collector items. It is suggested that you hang on to them. Do check out Eric Brigden’s new Gold Prospectors Forum. Sounds like a great spot to learn and share information on the placer mining industry. Click HERE and be sure to register. Vancouver, BC – Barkerville Gold Mines Ltd. (TSXV: BGM) (the “Company”) is pleased to report it has received approval of Mines Act Permit M-238 to develop an open pit gold mine at its Bonanza Ledge property near Wells, British Columbia. The Application, submitted to the B.C. 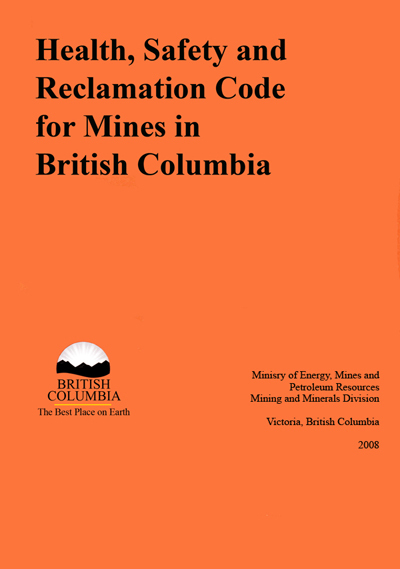 Chief Inspector of Mines in accordance with Part 10.12 of the Health, Safety and Reclamation Code for Mines in British Columbia in August 2010 was formally accepted for review on November 29, 2010. The proposal was reviewed by strategic provincial and federal government agencies, with coordination by the B.C. Ministry of Mines Kamloops office and subsequently by the Chief Inspector’s office in Victoria, B.C. Approximately 73,000 tonnes of ore per year will be produced at the Bonanza Ledge Mine, for a current mine life of four (4) years. The average grade is approximately 9.05 grams per metric tonne (or approximately 0.264 ounces per short ton). The mine design is the culmination of geological exploration, engineering and environmental studies undertaken by the Company in the Barkerville camp since the Bonanza Ledge deposit was discovered in 2000. This work included the extraction of a 10,000 tonne underground bulk sample at Bonanza Ledge in 2004 containing approximately 7,000 ounces of gold. Frank Callaghan, president and CEO of the Company said: “Approval of the Bonanza Ledge Gold Mine is a major accomplishment for Barkerville Gold Mines in its close to twenty years of exploration in the region. The company has invested its resources in the development of the property and the QR mill, and it’s great to see this project come to fruition. The mine site is on the southwest face of Barkerville Mountain at an elevation of approximately 1,480 m (4850′) above sea level and within roughly two kilometers of Highway 26. Existing access is in place to truck the mineralized material to the company’s permitted QR Mill, near Quesnel, B.C. for processing to gold doré. Community and First Nations consultation has taken place on the mine proposal over several years leading up to the Application, and feedback has been incorporated in aspects of the project design. A Memorandum of Understanding is in place between the Company and the Lhtako Dene First Nation providing for continued close cooperation and benefits related to development of the Company’s projects in the Cariboo region. This News Release contains forward-looking statements. Forward-looking statements are statements that relate to future events and conditions and therefore involve inherent risks and uncertainties. These statements are only predictions and involve known and unknown risks, uncertainties and other factors that may cause our or our industry’s actual results, levels of activity, performance or achievements to be materially different from any future results, levels of activity, performance or achievements expressed or implied by these forward-looking statements. While these forward-looking statements, and any assumptions upon which they are based, are made in good faith and reflect our current judgment regarding the direction of our industry, actual results will almost always vary, sometimes materially, from any estimates, predictions, projections, assumptions or other future performance suggested herein. Except as required by applicable law, the Company does not intend to update any of the forward-looking statements to conform these statements to actual results. All phases of the Company’s operations are subject to environmental regulation and governmental approval and permits and there can be no assurance that the Company will obtain all the requisite permits for future development. Mining is an inherently risky business with large capital expenditures and cyclical metals markets. Neither the TSX Venture Exchange nor its Regulation Services Provider (as that term is defined in the policies of the TSX Venture Exchange) accepts responsibility for the adequacy or accuracy of this release. 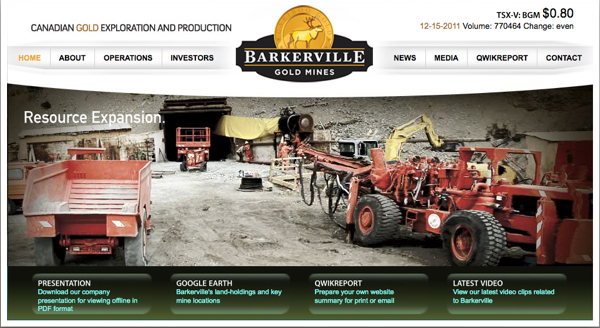 ©2010 Barkerville Gold Mines Ltd.